-- Select a Size/Color -- Fish - Out of Stock! Your playful kitten will love the KONG® Naturals Crinkle Fish Cat Toy! 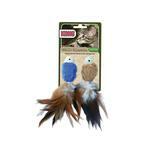 Your cat will have a swimmingly good time playing with these fun fish cotton kitty toys with natural feather tails. The crinkle sound and soft texture will keep your kitty engaged as they pounce, carry, and bat these fishy friends around. KONG Natural toys are designed to stimulate your cat's natural hunting and stalking instincts. All toys contain natural North American catnip, which encourages even more exercise and fun! KONG® Naturals prides itself on producing natural products for natural instincts. KONG Naturals are ecologically responsible, using only materials and dyes from natural, renewable resources. Comes in set of two. Colors may vary. Posted On 12/28/15 by Christine D from Dunstable, MA Yes, Christine D recommends this product! My kitty loves feathers, so this toy was a real winner. Each fishy has lots of feathers.